The Morris Family getting their A-game ready during the pre-start. There were 2 prevailing strategies at the start. I think most of us were in the dark as to the exact timing, but most boats decided to loiter in the area to the west of Baltimore light as the lighthouse was definitely the favored end. The start was going to be on port tack though, so a couple of boats decided to opt for the starboard tack approach sailing from the boat to the light house and this also seemed to work well as when the starting signal came, they were in a strong position to tack and be in the right place. Anyway, 7 of the 8 boats had a reasonably good start. Tim, Lanny, and TC punched out to an early lead with Jonathan, Larry, Me, and Mike fighting it out for 4th place. Almost everybody was sailing with the #1 genoa and some people had reefs in. We had elected to forego the reef and Ray Meyer later told me that he thought they had a speed advantage over us without the reef. What we lacked in speed we made up for in tactics and boat handling. TC, who later explained to me that he had a GPS fail, went really high on the first leg, overstanding the mark by a significant margin. Fortunately for me, I was not using GPS, but only a chart book and a magnetic compass and whether by dumb luck or skill, I determined that we should be pointing about 20 degrees lower than the rest of the fleet. Fortunately for us, the rest of them did not realize that they were overstood until they had sailed a good deal of extra distance. We were not quite fast enough to catch Tim, Lanny, or TC, but we passed everybody else and rounded the mark in 4th, a couple of lengths behind TC. Note skipper peering up into the rig, wondering how to fix this problem... Conclusion: Take down the colored sail and re-set. After re-setting their spinnaker they did just manage to eek by us but it was not matter as after the 2nd mark, they promptly sailed into a hole and we passed them again on leg 3 of the race. As we rounded Can 9, we had maintained our position in 4th and had the Adams family close behind. They went high for a bit and we stayed high to protect. For a minute I thought they were going to roll us but somehow we found just a bit of extra juice and managed to keep them behind us to hold on to position and finish in 4th. I told Jonathan that he should consider going to work for the godaddy.com advertising team as he had a cheering section on board that was chanting out 'go daddy' the whole way to the finish from Can 9, but unfortunately it just wasn't quite enough. Conclusion: you do not need colored sails to do fairly well. Smart white sail handling and a clean bottom can really do wonders for your scorecard. As you can see from the boat numbers, we were by far the strongest fleet present at this event. 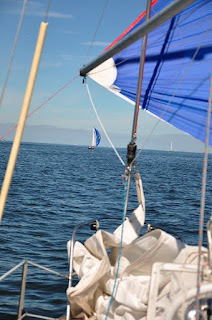 On Sunday, everybody realized what a light air day it was going to be and so we had no 'white sail' participants. This was probably the right call for all involved as in the end only 3 boats managed to hang on and finish the race. 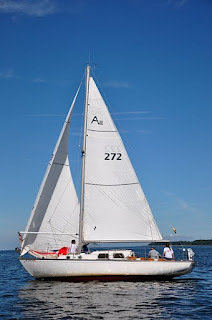 My crew who had just learned how to trim the jib on Saturday was somewhat apprehensive about learning a whole new sail on Sunday, but in the end it worked out well and she turned out to be an excellent spinnaker trimmer. It was not without incident though as we mis-timed the start, barely laid the boat end of the line and looked down the barrel of the rest of the fleet having about a 5 minute head start on us on a very light air day. Fortunately, due to my bottom cleaning skills, we managed to make up ground quickly on the rest of the fleet. Also, the kite was the right starting sail choice and helped us to pass 272 and 197 on the first leg. Fortunately, they managed to keep their captain aboard during this sail change although I am told that was not the case for all of their sail changes. After rounding the first mark, we went high while Helms, Adams, Meinhold, and Morris went low. High was the right call as breeze filled in from the south and we caught it first and held on to pass them all as well as gaining significant distance on the leaders. Solstice eventually decided that they wanted to get some of what we were in and headed up to join us which helped him to stay connected to us and the leaders. 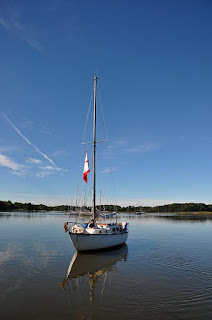 However, he eventually decided to continue sailing high all the way to Kent Island which wound up not being in the direction of the mark and eventually they got so far away that we could barely see them take their sail down when they decided to hang it up. Ah how the view changes when you are in front! This is Rinn Duin and Laughing Gull duking it out with the Tritons for clear air. We were gaining on the leaders! But we were at least having a good time. Note dodger deployed. That is a key piece of equipment for a race like this! Personally, I think I had the best looking spinnaker trimmer in the fleet! She also happened to be quite good as we managed to pass 4 boats from a 5 minute behind start (skipper's fault for starting late)! All in all, it was a wonderful event with excellent weather, competitive racing, great social, and a good time had by all! The Bruce Rankin memorial regatta is coming up on 10/17-18 at PSA and I hope to see everybody there! I'm sorry - a Webbie with a skilled AND good looking crew!! That deserves a comment. Mine signed on in 1978.